I am still working on the coffee table. It’s been a while since I have tackled a mosaic piece so large and i am growing impatient with the process.. The coffee table is approximately 36″x18″ which doesn’t seem that big until your staring at the vast empty substrate that needs to be covered. That’s a tad melodramatic, I am actually making a lot of progress, I am about halfway through the mosaic now. If all goes according to plan, it should be finished in the next week. For my next project, I had planned on making of small wall hangings, and selling them as a pairs. Most of my mosaics use 3/4″ wood for both the frame and the mosaic design. I have some 1″ thick pieces that I thought would work as frames. I don’t have a thickness planer so my first idea was to use the thicker wood,for the frame and use 3/4″ pieces for the mosaic,creating a shadow box. I dry fit some pieces to see what it would look like. It looked okay but there was something off about it.. I dug through the wood pile looking for any 1″ thick scrap. I found walnut, oak,,cherry, cedar, and,pine. I put together a quick pattern, and I have enough wood to make at least one more 1″ thick piece. 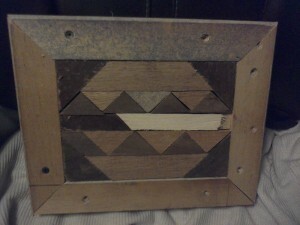 This entry was posted in barn board, repurposeing, scrap wood, wall art, wood working by brighid. Bookmark the permalink.